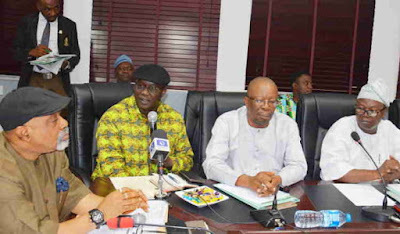 strike on Tuesday to challenge non-usage of the N30,000 the lowest pay permitted by law requested by the Tripartite Committee on National Minimum Wage, the presidency has moved to pacify the workers, appealing to them to tarry a while on their planned action. 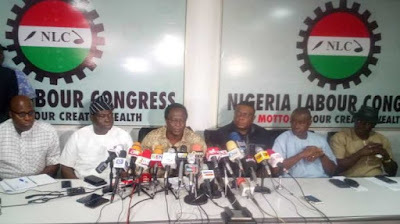 The NLC had asked President Muhammadu Buhari to submit the N30,000 minimum wage implementation bill to the National Assembly for passage by December 31 last year or face a nationwide strike action. With the deadline unmet, the NLC President, Mr. Ayuba Wabba, had said the Tuesday strike had become imminent despite a federal government offer for a resolution meeting schedule for January 8. Authoritative presidency sources, however, told ThisDay that the president is making efforts to resolve the wage dispute, which threatens to further obstruct the nation’s fragile economy should the strike hold. State governors under the auspices of Nigerian Governors Forum had objected to N30,000 as the baseline wage bill for the federation on the grounds that most of the states could not afford it. Offering N22,500, the governors said anything more would send most of the states into insolvency. But labour disagreed, contending that N30,000 was a compromised figured, which if diligently pursued would be realisable. “The president met with the representatives of the governors and appealed to them to plug areas of waste as a way of securing the funds to meet the workers’ demand,” a source told ThisDay. He said the governors had agreed to heed the advice of the president and had gone back to evaluate their finances, adding that what was needed was some more time for the governors to report progress to the president. “Certainly, the governors need to come back to the president with their revised position before he could proceed to the National Assembly with an implementation bill." Stating that time, though now a scarce commodity, was what was needed to resolve the logjam, he explained that even if the president was minded to proceed to the National Assembly with the bill as requested by labour, the federal legislators had been on Christmas break, adding that there was no way the NLC’s demand could have been met. “The National Assembly had been on break. And so, even if the president is to overrule the governors on this, there is no way the National Assembly can reconvene before the Friday deadline given by labour,” he said. Wabba had called on the federal government to urgently transmit the bill on the new national minimum wage to the National Assembly for a speedy passage. He said, “It is unfortunate that the federal government is yet to transmit to the National Assembly an executive bill for the enactment of N30,000 as the new national minimum wage. “Government’s dilly-dallying on the issue has strained government-labour relations with a potential for a major national strike, which could just be days away. However, the federal government said it would meet with Labour today (Friday).